We talk a lot about clearing chaos around here. Sometimes it’s clearing the chaos of your schedule, of a negative mindset, or stress. But in this episode, we are talking about the clutter of your home. And who better than to teach us a thing or two than the guru herself, Allie Casazza. Allie Casazza is wife to the boy she sat next to in seventh-grade algebra class, and mom to their four kids. She’s a writer and the creator of Your Uncluttered Home- an online decluttering course that earned her national attention for her philosophy of simple motherhood. 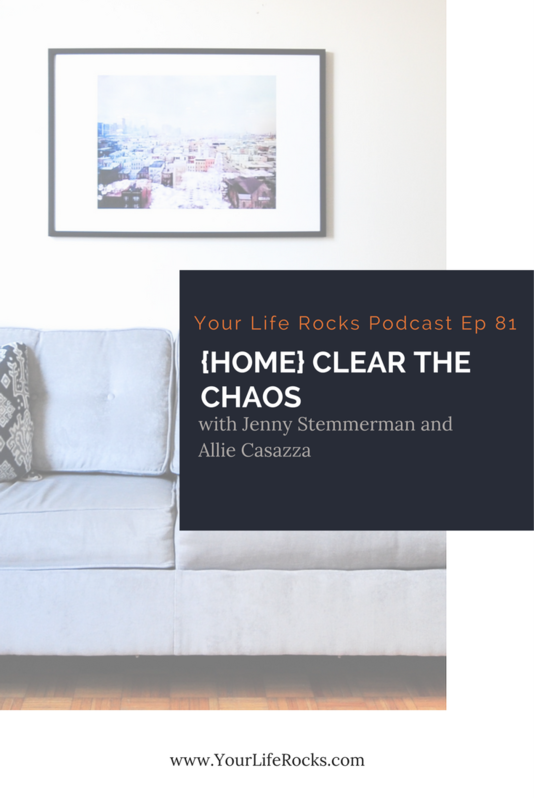 Allie has been featured on Good Morning America, The TODAY Show, The Jenny McCarthy Show, ABC News, and other popular media…….and now Your Life Rocks Podcast. Of course, we have some actionable steps of things you can apply right away to clear the chaos in your home. I hope you listen in to the podcast because she goes beyond these tips in a big way. I’m talking about how to encourage your kids to clear the clutter and help if your husband doesn’t get what you’re doing. 1. Avoid an all or nothing mentality. You don’t have to declutter and clean out every part of your life and every room of the house all at once. Take it one step at a time. It is a process and it might take you several times to go through your house to clear out the chaos to the point you want it to be. 2. Decide how much time you want to commit to this and put it on your calendar. It might be an hour on Saturday or 20 minutes every day after work. Choose what works for you and commit to it. 3. Start with the physical clutter. Start with a room like the bathroom. As you go through stuff ask yourself when was the last time you used it. If you can’t remember or it’s been awhile, time to get rid of it.